Thor-Ice Poultry Chilling Solution Is a patent pending solution, developed specifically for poultry processing. Used to chill colder and more rapidly than existing technologies, the Thor-Ice Poultry Chilling Solution helps increase freshness that customers and governmental controls demand, while extending shelf life of poultry. It also increases chilling throughput of the system. 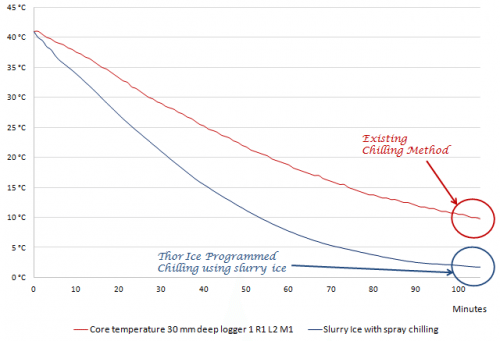 By using Controlled Slurry ice as a chilling substance and applying Thor-Ice Poultry Chilling Solution, processors can successfully improve chilling without making radical and expensive changes to the production processes. Our plug-in and bolt-on solutions save time and money without interrupting production flow. Across the industry, increased attention is on bacterial counts, energy costs, and enlarged poultry that is becoming too big for existing lines. Thor-Ice has developed retrofit or bolt on systems that are fully controllable and economical. Their low investment cost saves energy and speeds up production with an optimizing effect on operations and environment. Return on investment is often 1 year or less. Producers are satisfied as they avoid having high investments in and around the chilling chambers, since Thor-Ice solutions easily fit into any existing set-up by boosting chilling results. Our system for poultry processing are intended for all sizes of poultry producers. 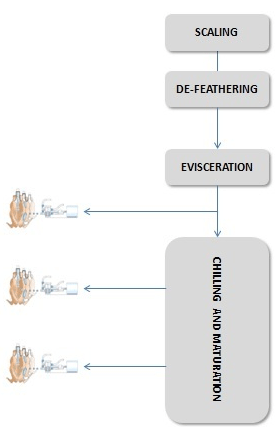 ThorIce Slurry Ice machines and systems for poultry chilling have been developed by and in close collaboration with well established European poultry producers, food institutes, and teams of scientists. Thor-Ice offers solutions that vary in size and can be adjusted to each client’s preferences. 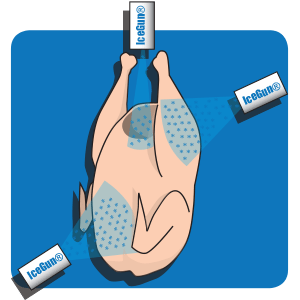 The IceGuns are designed to spray IceSlurry at the correct concentration and temperature to maximize cooling efficiency. 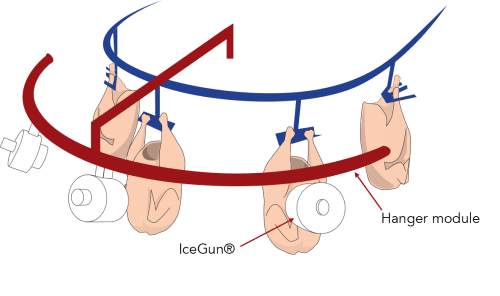 The number of IceGuns and their position will differ at each site in order to adapt the individual processes and to maximize the desired result.